An addiction to pain killers nearly derailed Adam’s life. He checked into rehab to get well and rejuvenated his love of muscular physiques. Then Adam built one of his own! I realized I needed to change my life or I was going to die from addiction. I was prescribed pain medications for two years for a herniated disk and annular tear of L5-S1 disks. My weight was out of control and I lost all motivation to take care of my body. My blood pressure soared high, as did my weight. I was taking the strongest narcotic dose doctors could prescribe me. The prescriptions quickly took a turn towards addiction and I was on a crash course toward a very young death. I awoke January 1, 2012 and faced the reality that I had become addicted to opiate pain medications and needed help. I spoke with my wife and told her I needed to check into a detox/rehab clinic. One of the hardest things I have ever had to do was admit to my wife that I had a problem. I took the first step towards changing my life and body that day. I made up my mind that I was going to reclaim my body and become the man that my wife had married. I wanted to strengthen my core and try to relieve my pain naturally through proper nutrition and exercise. On March 28, 2012, I found the MusclePharm Live Shredded contest on Bodybuilding.com and decided to enter. 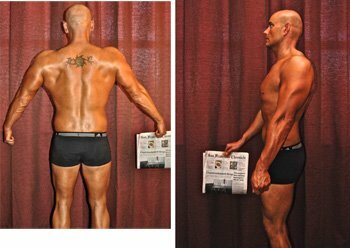 I began researching proper diets and exercise programs along and found many great articles and videos on Bodybuilding.com. I knew I could do it. So, with my wife's support, I began the journey to transform my body. I loved the look of muscular bodies since I was young. I knew if I ended my addiction to painkillers, cold turkey, then I could change my body. I sought the help of local physique competitor, Kaley Carson, in my hometown of Truckee, California. She built my diet and cardio program from day one of my 12-week transformation. I read for a couple months about proper lifting techniques and got the basics down to begin on my own. I spent every night reading and watching videos about different training principles on Bodybuilding.com before bed. I frequently read 4-5 transformation articles for daily motivation. I had a strong desire to change my physique and never really doubted myself. It was difficult to finish all of my meals at first. My body was not used to eating every 2-3 hours and drinking a gallon and a half of water everyday. But after a few weeks, I began to get the hang of it. For me, the meal frequency and schedule was the toughest aspect. Cardio training twice a day for 35 minutes wasn't that bad and the weight training was a fun challenge. I enjoyed seeing how hard I could push my body. I used 5 grams of ON Glutamine between meals. I go to absolute failure on all sets. I completed two 35-minute cardio sessions every day. Session one was typically done in the morning and after breakfast. Eating before cardio allowed me to perform with higher intensity. The first session was 35 minutes of high-intensity intervals on the elliptical. My second cardio session was completed after my weight training and was low-intensity walking on an incline treadmill. Choose any area of the body that is lagging behind and give it extra work. The most difficult aspect of my transformation was staying true to a strict diet. I love to cook and eat. In fact, I cook all meals for my wife and I. I prepared a separate meal for her each evening. I'm not amazing in the kitchen, but do consider my cooking very tasty. 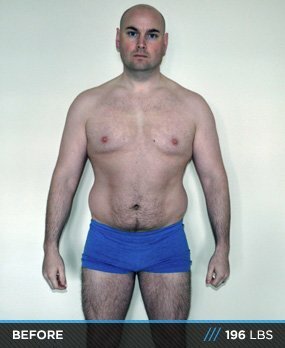 I had to resist digging into my wife's food and fight cravings for frozen pizza and Ben and Jerry's every day for the last four weeks of my transformation. But, I stayed strong and made it through one meal at a time. I'm still dieting currently to compete in my first bodybuilding show. I've always wanted to step on stage and display a perfectly ripped and muscular physique. Trust that your diet will work. Six packs are made in the kitchen. Take every set to failure while training. Make sure you tell everyone the plans to transform your body. It will make you accountable to follow through. Keep everyone in the loop with your progress. If you slip up and have a cheat meal, get right back on your diet. Don't allow it to become a cheat day, or worse yet, a cheat week. Meal frequency is one of the most important aspects. It will keep the cravings at bay and you'll feel less hungry throughout the day. Stay busy. Always try to fill your time so you're not bored or tempted to eat junk. Rid your home of junk food. If possible, give it to a food bank to help others. Prepare your food in bulk and pre-portion/weigh your food to save time. 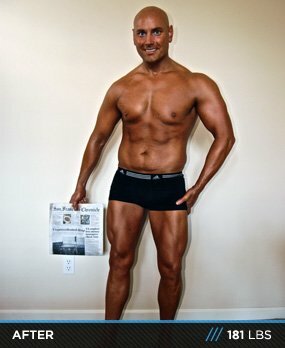 From the first order I placed at Bodybuilding.com I realized how great the customer service was. I have many options to buy all things fitness at local retailers, but Bodybuilding.com really makes me feel as if they're a local store. I stayed awake for an hour or two, lying in bed watching videos on Bodybuilding.com every single night. I loved watching Kris Gethin transform his body. He was a huge inspiration and gave me tons of amazing information. I could not live without the endless supply of how-to videos and articles. Bodybuilding.com is my number one website and has become my favorite place to spend hard earned money. Thank you all for such amazing support. From day one, my wife Patricia was at my side. She encouraged me when I was down, grounded me when I flew too high, and has loved me every second of every day. She is my heart. To my brother and best friend, Scott, who pushes me to be the best I can be every day. To my beautiful and amazing sister, Erica, who was a catalyst in my decision to begin this journey. Her physique is flawless and her work ethic is second to none. To my wonderful friends, Alex and Tara, who took my after photos and encouraged me to keep up the hard work. To Kaley, who helped my diet and gave me cardio recommendations. Of course to God, my parents, and my entire extended family and friends who have been behind me the entire way.